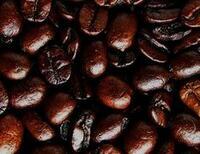 Would you like to be able to choose your personal favorite coffee and enjoy the aroma of freshly ground beans? Then this is the system for you. You can adjust all machine settings to perfection to suit your beans and your taste. 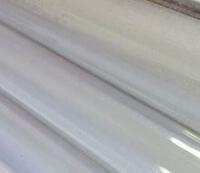 The centrally-positioned spouts are height adjustable from 3 to 6 in. to suit the size of your cups. Perfect for the smallest espresso cup to a tall glass for lattes. When the machine is switched on, the spouts are automatically rinsed, ensuring a freshly-cleaned and warm system is ready and waiting from the first cup. 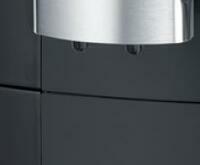 The rinsing function is also automatically activated on switching off the machine - perfect hygiene from Miele. Barely audible: Quietly ground coffee with perfect results every time. 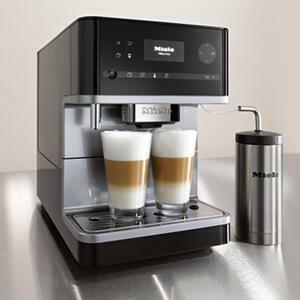 Single or double: Extra program for preparing one or two cappuccino or latte macchiato. Particularly convenient: "Thanks to the heated cup surface, pre-heated cups are always available." Energy saver: in eco mode, the appliance only heats up automatically just before the preparation process starts. Easy to remove and clean: The guarantee for impeccable Filtration, long service life and perfect coffee enjoyment. Very sensible: The lock prevents unintentional operation, for example by children. Water Tank Capacity: 61 fl. oz. 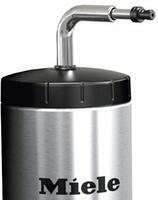 Bean Container Capacity: 10.5 oz. With direct access via the service door, simply remove the brew unit from the coffee system, then rinse under running water to keep your system clean and prevent build-up. 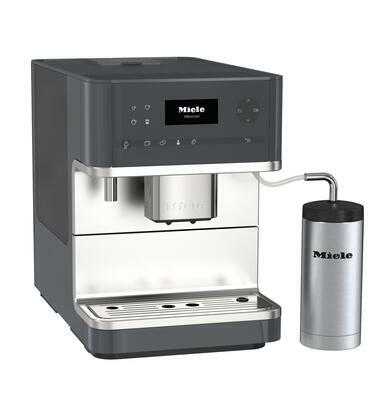 Miele's insulated milk flask, made of double-walled stainless steel keeps milk cool for up to 12 hours without any loss of quality. 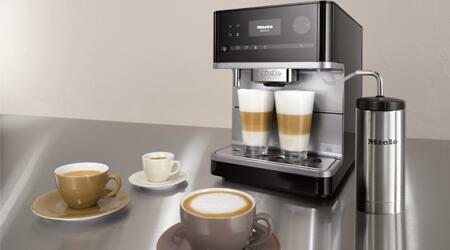 Guarantees uniformly perfect steamed milk for cappuccino, latte or macchiato. The dispensing spout is height-adjustable to accommodate an array of cup sizes, from the classic petit espresso to the average American mug. This Coffee maker will grind whole beans to make your individual cup of coffee.